Combine mozzarella balls, tomatoes, and chickpeas in a medium bowl. Add olive oil. Stir, taste, and add salt and pepper to taste. Wash spinach, and layer it in the bottom of a serving bowl. 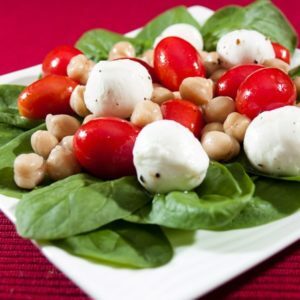 Arrange 1/2 cup of mozzarella-tomato-chickpea mixture on top of spinach. Serve at room temperature.